I came to my experiment in WWOOFing (World Wide Opportunities on Organic Farms) half through bad luck and half through feeling more driven to think seriously about climate change alongside long-felt wonderings and a handful of potential research questions about getting back to the land, and the relationships between city and country. A work contract ended suddenly, unexpectedly and tragically, because while the community building was going better than we ever projected it would, it still needed care and time in its early stages. I left it to almost certainly become something smaller and limited than it should have been, and it broke my heart a little bit. I had only just started thinking about the arduous process of applying for my first full academic position in the autumn, and those job notices were just starting to appear. No work or real prospects, no money, and an expensive London flat. Panic happened first of course, but after a few days I was able to ask myself what I would really like to do if money and career and etc. were not factors. I’d been in big cities too long and longed for country slow and quiet, and I’d been reading a lot about permaculture (which I had tried to a small degree, and written about long ago for Dr Pop), so learning-by-farming out in the countryside seemed something brilliant. That, or working on an archeological dig. So I did a little online research. Thus I discovered WWOOF. It is a whole network of organic farms across the UK and worldwide (Australia, New Zealand, Japan, the US among others) where you learn and work in exchange for room and board. There are now an estimated 100,000 WWOOFers and 15,000 hosts in 105 countries around the world. There are about 650 hosts in the UK, from Scotland to Wales to Cornwall. As I talked to people about future plans, I discovered how many of them had friends and family members who had wwoofed, or had done it themselves. My friend Tom from our cafe had spent almost a year traveling around in an old van. He said you could find farm work within about three days of rolling into pretty much any village. I wasn’t quite that sanguine, so pored over lists and maps and thought about what I wanted to learn. I wanted to play with lambs, that was certain. But learn all about as many various aspects of farming as I could. 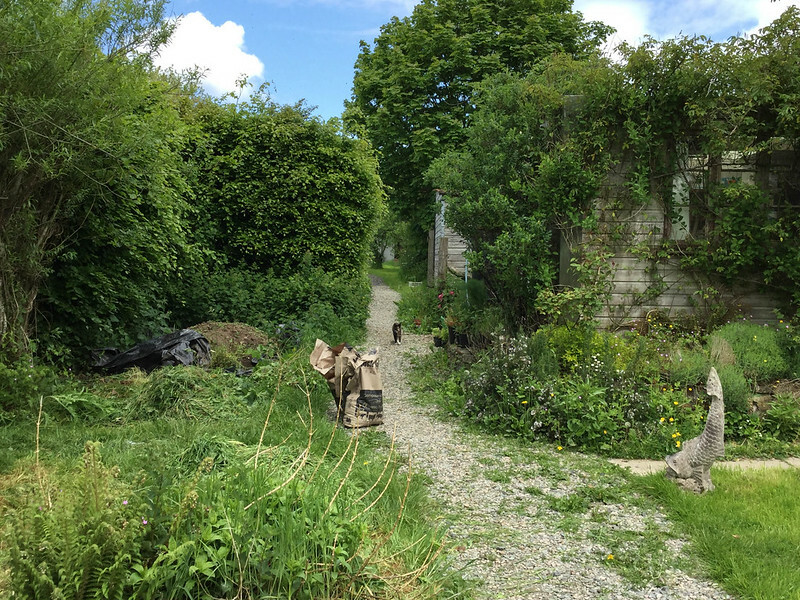 I wanted to practice and learn about permaculture, and explore the relationship between living off the land and living in a city. I wanted, if possible, to learn more about how the countryside has been constructed over centuries, how land has been managed for local sustainability and for food and fuel export to towns, how to better read the ancient and industrial signs that make this landscape so amazing. I also felt that this followed the same lines of the kind of community projects and connectivity we had been trying and successfully starting up in London’s East End, built entirely around the projects for positive change that people themselves suggested and volunteered to help start. Rooted, of course, in a different landscape and economy, this seemed to still be quite an amazing aspect of the sharing economy, based around ecological and environmental principles. It has not disappointed me in that respect. I have been to two of the three farms I have already committed to, spent a total of about a month and have another month on a Derbyshire farm left to go. The first was a smallholding (a vital distinction between the large industrialized farms who have responded to supermarket demands and produce at massive scale, and smaller farms) in Gloucestershire. 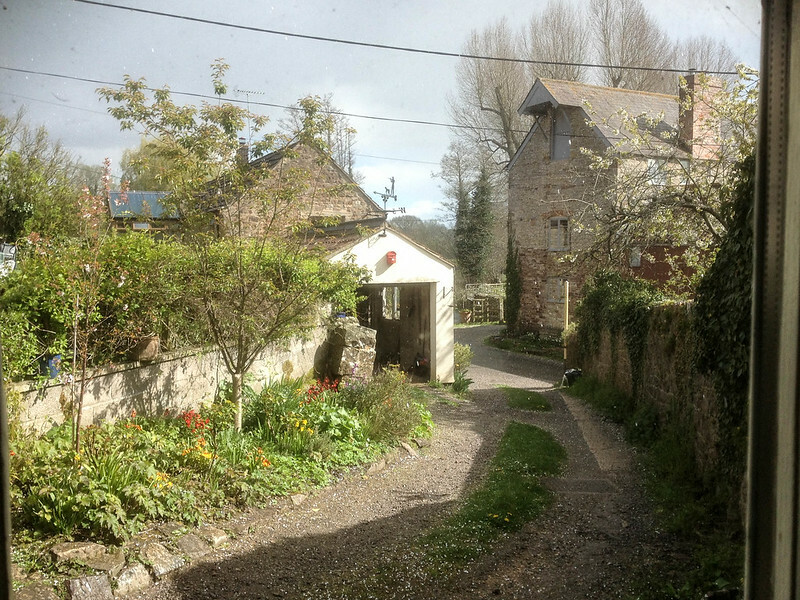 They raised sheep and apples for cider in a little farmhouse alongside an old mill — quite idyllic really. I weeded and replanted bulbs on steep banks to make them beautiful for everyone using the lane, but mostly I remember the sheep. 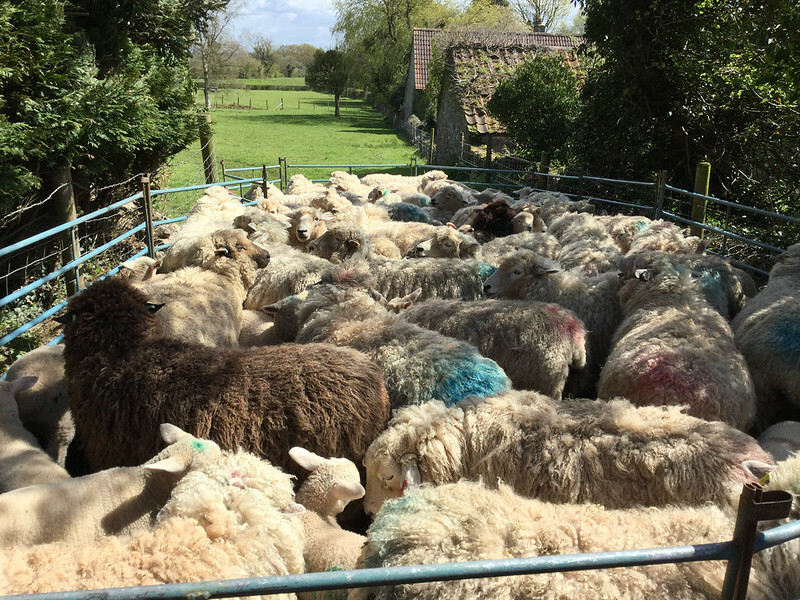 I plowed into this heaving mass to catch 65-ish lambs on one memorable day of utter exhaustion. I learned tons about sheep, and also, surprisingly, mining. I had epiphanies about just how beautiful labour can be, as you watch people doing what they do with consummate skill. I have not been so tired or so constantly hungry in a long time — probably not ever. But it got better. You could read the more day by day lessons and complaining starting here. I learned that lambs really aren’t much fun. Luckily at the next place I learned goats — particularly baby goats — are amazing. I also learned about growing food, about the landscape, about forest management, about herbs. I have written a walkthrough of the incredible microclimates and wonderful beds created from a windswept field over the period of twenty years here, but I loved most just how beautiful good design can and should be. I also had a taste of agricultural work producing and picking for sale in a market, which is so different and so much hard work. I learned to use old tools like a scythe, and to milk the goat and to make dumplings. A walkthrough of my time at Ceridwen in West Devon starts here. But I suppose the real things I have learned have been much bigger, and above all I have loved how they have humbled me in the very best of ways. Unlike many who are journeying from place to place searching for themselves (and a couple of people actually used those words — I am here to find myself), I felt more like a self searching for a place. But many of the lessons are the same I think. Above all I was humbled by the generosity of the people I have been staying with, the way they opened their homes and welcomed us into their families, the roles of care and caretaking they played in their communities. I loved hearing their life stories, and about their battles to keep the smallholdings a working concern when policy and the economy constantly push in the other direction. Wwoofing has become an integral part of that, but I loved the feeling that I was giving as much as I was taking, and helping to keep something precious alive and growing that we will need as the future becomes darker. I was deeply humbled by the knowledge they hold and all that I don’t know. Knowledge best shared through working side by side, and I also loved this aspect of wwoof, though I also enjoyed the time I got to spend weeding the beds on my own listening to Welcome to Night Vale, podcast of the weird and wonderful. I was humbled discovering all of the things that people now buy without thinking, but that they once were able to provide for themselves through careful management of the land around them — above all I was humbled by this management of land and woods, coppicing, pollarding, hedging. The skill and capacity to grow their own food and forage from the wilder lands around them, obtain fuel for heat and cooking, obtain clothing through production of wool, shearing and spinning and dying and knitting and weaving. I was humbled by the people doing this alongside me, some set to learn skills for a way of life they know they want to adopt, others searching for themselves, all of them taking action in their quest to create a better world in the face of climate change and the horrifying unsustainability of western lifestyles. Funny that it’s really only out here growing vegetables and worrying about sheep that you realize just how much the climate is already changing and weirding, which is putting smallholdings at ever greater risk. It is not our future, it is our present. I confess, and I know it is very different for wwoof hosts on a very different journey, it is quite wonderful to not worry about paying rent, or where your next meal will come from. You could live for a very long time on almost nothing, as long as you weren’t seduced (as I often was) by the pub or an overwhelming desire for chips (fries to you) and chocolate. But even with such expenses, this is a way to step out from what you know, to enjoy the countryside, to learn and learn and learn, and to leave for a while that push of work and rent and city streets. Not that you stop working, but as I discovered in my last job reclaiming pallets to built furniture and raised plant beds, I really love hard physical work. The next farm has both sheep and cows, chickens and ducks, an archeological trail and organic gardens. It’s a nice thing to look forward to as the academic job search for all the immense effort required goes precisely nowhere. This is so cool. Cindy has been talking about wanting to do something like this at some point. Thanks for sharing your experience. We (Cindy and daughter Afton and I) are going to be in England this summer from July 26 through August 7th. We’ll be in Gloucestershire from August 1 through 3 and London from August 3 to 7. Any chance of meeting up somewhere for a drink? It would be great to see you and hear about your work and adventures. Greg! I have been traveling and working on lots of things and let this fall of the plate, I am so sorry! I wasn’t in the UK then but I still meant to reply immediately, so I’ve little excuse, but I’m so happy you liked it! I’ve been needing to update it as well, as my third farm wasn’t at all the same, and left me feeling a little more like running back to the city and some luxury. But over all I loved it and might be doing a bit more of it! I hope you enjoyed your time in England, and I hope the weather was wonderful! I got here through your review of Roy Scranton’s Learning To Die in The Anthropocene – which I thoroughly agreed with!